At Aspire Bifolds, we specialise in providing a big range of bifolding doors. Two of our best selling brands are Origin and Schuco. 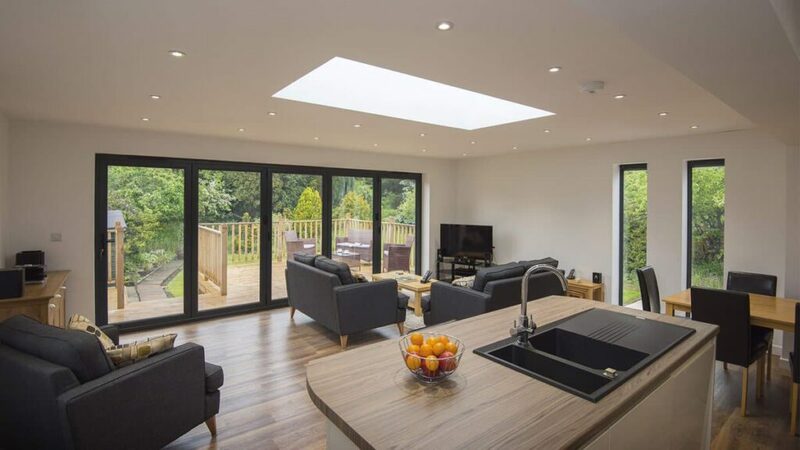 In this article, we compare Origin and Schuco bifolding doors to help you decide which bifolding door might be the best for your home. Origin and Schuco bifolding doors are both excellent, but each brand has its own set of particular features and selling points. It is also helpful to have some information about the history and the companies behind these great brands of folding doors. Origin and Schuco bifolding doors information. Schuco is one of the world’s best-known aluminium door and window designers for over fifty years. Not only does Schuco design fantastic windows and doors for the home, but they also specialise in very specific aluminium products. Some of the most famous buildings in the world are glazed with Schuco facades and windows. Schuco also designs fireproof, bomb and bullet resistant glazing as well as windows for high secuirty buildings such as prisons, Government offices and many more. This means that the engineering and design of a Schuco bifolding door has a wealth of expertise behind it. The engineering and design of Schuco bifolding doors is what makes them unique. Origin is one of the best known brands in the UK for aluminium bifolding doors, also offering windows and entrance doors. Origin understands the British customer and has created a bifolding door that is exceptionally well made and offers a host of personalisation options. The quality and versatility of an Origin bifolidng door is what makes it so popular. Origin and Schuco bifolding doors compared. Bifolding door mullion sight lines 154mm thinnest. Just 120mm, one of the thinnest. Bifolding door sight line at the edge. 140mm 131mm, thinner all round. Threshold options. Two Four choices with better weather performance. Maximum door heights. 2.5 metres. 3 metres. Maximum glass thickness 32mm double or triple glazed. 45mm double or triple glazed gives better performance. Which is the better bifolding door? Origin or Schuco? Both Origin and Schuco bifolidng doors are an excellent choice but Schuco does provide more if you are looking for a higher specification bifolding door. Schuco bifolding doors are slimmer than Origin, give you bigger door sizes than Origin and more design flexibility than Origin. Origin bifolding doors have a longer guarantee than Schuco, more handle colour options than Schuco and are available on faster lead times if you are in a rush to have your new bifolding doors made quickly. Both Origin and Schuco bifolding doors will give you a premium aluminium bifolding door and you will get the same opening and folding options with both brands. However, it is worth considering that most of the year your doors will be closed. If you intend to use your new bifolding doors to make the most of looking out to your outside space, the substantially thiner sight lines of Schuco, at over one inch thinner, really does make the difference when the doors are closed. Schuco bifolding doors are one of the slimmest doors you can buy today. A thinner bifolding door means bigger glass, more light and better views through the closed doors. Schuco doors will give you engineering and design that you cannot see, but you have the peace of mind that it is there. The door catches on a Schuco door for example are a superior quality door catch with adjustment, compared to the Origin door that uses a magnet system. Both will do a fine job of holding your doors together when they are folded back, but the Schuco door catch is better by design. Want to see Schuco and Origin doors together? Visit Aspire Bifolds’ Showroom. Our Showroom is the best place to compare Origin and Schuco bifolding doors. We also have bifolding doors on display from other brands as well as sliding doors and many other home improvement products. Contact us today or come into our showroom and try out the excellent Origin and Schuco bifolding doors and talk to us to find out more.